Velezita: Been There, Done That. Thanks. Been There, Done That. Thanks. 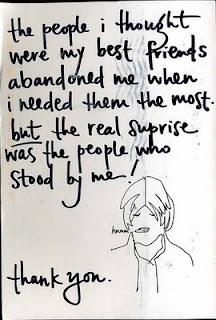 Sometimes when I read the secrets at postsecret I think "Been there". This was one of those times. People will surprise you. When I was going through what was maybe the most heartbreaking time of my adult life I experienced this. Some of the people I would have expected to support me withdrew their offers of help and people who I thought didn't care for me rushed in and offered support. I guess we all have different qualities and they aren't always obvious to us, let alone others. Everyone has probably heard the old saying about friends being for a reason, a season, or a lifetime. Cheers to anyone who's ever been there for a reason. really people still surprise us. Wonderful blog - keep up your work! Friday the 13th, Oh Lucky Day!